And a new Word runs between: whispering, "Let us be one!" The term Middle East was born in the beginning of the twentieth century. It would have been unthinkable without a series of spatial transformations in the nineteenth century, including the deployment of new steamer and telegraph lines, railways, and the Suez Canal, which together constituted a new West-East route via Egypt and gradually replaced the long sea voyage to India around the Cape of Good Hope. The geography we now deem natural was produced by these technologies of transportation and communication. The longue durée expansion of European trade and colonialism was shaped by the monopoly of Muslim merchants, cities, states, and empires over the major transregional trade routes to the East and their alliance with Genoa and Venice. The desire to circumvent these middlemen was a key impetus in the European search for a sea route to India and direct access to the spices and textiles coveted in Western Europe. In 1492 Columbus voyaged across the Atlantic, looking for a westward alternative to the overland trade route to the Indies. This desire was fulfilled several years later with Vasco da Gama's "discovery" of a direct sea route to India around Africa via the Cape of Good Hope. Ironically, the feat was made possible by an ensemble of Islamicate seafaring technologies, navigational knowledge, wind records, and expertise. Da Gama's 1498 Indian Ocean journey from the Cape to Goa was guided by a Muslim pilot. Europe's "great divergence" at the turn of the nineteenth century has been attributed to the opening up of these New Worlds of possibility. The great distances separating the disjointed parts of the European early modern colonial empires-empires born out of such famous voyages-fragmentized their geographies, and hence their politics. Until the nineteenth century, a one-way journey between England and India along the sea route around Africa could last an entire year-a delay requiring that most decision making and administration take place "on the spot." Yet during the second quarter of the nineteenth century, the Overland Route to India via Egypt-one of the key routes whose circumvention propelled the European colonial project in the first place-was rediscovered. In less than two decades, between the late 1820s and the mid-1840s, travel time between England and India had shrunk to one month, and the distance between these two places imploded. The gradual abandonment over the next three decades of the sea route around Africa significantly contributed to a rearrangement of the eastern parts of the British Empire. This space could gradually be traversed and managed as a continuous geographical, political, and economic surface formally governed, since 1858, from London. This reconfiguration was not simply a result of technological acceleration or the preference of one route over another. Rather, it involved a complex negotiation among people, energy sources, engineering techniques, cultural protocols, and economic forces that gradually interfaced in more and more synchronized and stable manners. This chapter explores how this process created the British route to India via Egypt, overland and also over and underwater. As far as Egypt is concerned, it examines how this country was gradually annexed into a global technological, notional, political, and economic world beyond its borders. How did Egypt emerge simultaneously as a new geographical hub and as a political and economic periphery in a refashioned British Empire? We cannot discuss time without recourse to spatial concepts. Exploring this paradoxical "Middle Eastern" spatiality and the embryonic forms of politics spawned by the temporal standardization and synchronization that created it thus lays the groundwork for the equally contradictory temporality that will come to punctuate this space-the "Egyptian time" recounted in the following chapters. The surfacing of Egypt as a middle ground between a Britain and an India that were distinct parts of a single colonial empire can be ascribed to the very outcomes of the European success in circumventing Egypt as a central junction of East-West trade and traffic from the turn of the sixteenth century onward. The opening of the Americas and of the sea route to India intensified the gradual and uneven decline of the Mediterranean and weakened Ottoman influence over transregional trade and politics. The subsequent hegemony over trade and later the colonization of production brought unparalleled wealth to Western Europe, eventually financing its industrialization. The development of steam power in England at the end of the eighteenth century expedited technological developments in seafaring, improving communication with overseas colonies. The Industrial Revolution provided financial and political incentives for using steam power to bring England and India closer. Great profits could be made not only in the colonies but also in the growing industry of transportation and communication that linked them with Europe by moving goods, travelers, and information. The opening of the Egyptian route was attributed (by historical actors since the early 1850s and until recently by historians) to one of these profit seekers, Thomas Waghorn (1800-1850), a pioneering son of a butcher from Chatham. Yet historians have shifted lately from their longstanding admiration of Waghorn as the route's founder to dismissing him as a self-promoter and exaggerator who unfairly claimed credit for a process that also involved many others. Both admiration and criticism make Waghorn a suitable first protagonist for this chapter. (He will later be joined by a dying camel and a semiliterate sea termite.) Waghorn indeed simplified a complex and heterogeneous story into a morality tale of great men and entrepreneurial spirit. Keeping him at the center of this decentered history is a way of keeping in sight the importance of simplification as part and parcel of hybrid histories involving multiple human and nonhuman actors. (Mis)representation, as all three protagonists will demonstrate, was itself a historical force, often constituting very real environments. To begin recounting the creation of the new Egyptian route, a process whereby geography and technology produced each other, we might start with the geotechnical coincidence that fueled the Industrial Revolution. Whereas coal and even basic steam-engine technology could also be found outside of Britain, the geographical proximity of British coal mines to mechanically skilled artisans and water transportation networks, as well as a related mining problem-the need to pump out water-may explain early nineteenth-century developments in British steam engines and the country's growing reliance on fossil fuels. A similar argument can be made about subsequent attempts to use steam engines to travel by water. Ocean steamers presented a new set of problems for shipbuilders who needed to develop new designs for vessels carrying their own energy source onboard. For example, the Dutch steamer Atlas, built in 1826 for the purpose of testing the practicability of steam navigation between Holland and Java, failed because it was too large and heavy for its engines and steering systems. The Atlas's size was a direct result of the fact that it was designed to carry a sufficient supply of coals for the entire voyage to Java, because the Dutch did not have any settlement at which they could stop for refueling along the way. By contrast, British ocean steamers could be much smaller (and therefore cheaper to build, and easier to propel and navigate) because they could stop for refueling when circling Africa. In both the Dutch and British cases, imperial geographies were mapped on the design of ships, and vice versa. Imperialism operated at the level of the engine, the size and shape of the ship, and the political map of the ocean it crossed. It was simultaneously an engineering factor and a political vector. From the design perspective, in the ideal steamer coal occupied all free space, leaving no room for cargo or passengers. Waghorn, a young lieutenant stationed at the Bengal Pilot Service during the early days of ocean steam navigation in the 1820s, was obsessed with designing and commanding a steamer that would be able to make the journey from England to India via the Cape of Good Hope. He proposed to solve the aforementioned design problem by building small steamers whose voyages would be financed exclusively by delivering newspapers and letters between the metropolis and the potential coaling depots along the way to India. Steam power was expected to cut one-way travel time roughly in half, to six months. Waghorn aimed to translate this saved time into capital, increasing mail fares to the point at which steam navigation would become profitable. Waghorn spent the second half of the 1820s trying to gather support for his proposed steamer line via the Cape. Among his interlocutors were engineers, members of Parliament, colonial officials, and merchants, making it impossible to neatly categorize this scheme as political, economic, or technical. It can be labeled a failure, however. Existing post laws compelled all vessels on the Cape route to take letter bags on board free of any sea postage. Any change in postage fares required an act of Parliament. Waghorn, who thus had to seek his fortune elsewhere, accepted an invitation to examine the possibility of steam navigation in the Red Sea. A rapid and well-publicized trip in 1830 from London to Suez and from there to India convinced him that his destiny was as the proprietor of a private Overland Route mail agency. One of the ways he promoted this agency was to claim the discovery of a new route to India, even though other Britons were already aware of it. This false advertisement proved extremely durable. Waghorn's career trajectory reveals the acceleration of British communication with India. As late as the 1820s, sailing via the Cape could take as long as a year. Waghorn's 1829 plan for steam communication on that route was meant to reduce this time by half. During the same year, even that hypothetical record was broken by Waghorn himself in his first rapid journey to India via Suez, which lasted four months and twenty-one days. In half a decade of operating an efficient private line, he reduced this time so significantly that by 1835, after the advent of Red Sea steam navigation, a ninety-day journey was considered slow. In 1837 the journey lasted about fifty-four days in each direction, and between 1841 and 1843 Waghorn reported an average traveling time of thirty-six days. When the plan for a Cairo-Suez railway (abandoned in the late 1830s) was reconsidered in 1844, one of its goals was to reduce Indian communication to less than one month, enabling letters from India to be answered by the ensuing mail to India. In less than fifteen years, the distance between India and England shrank to approximately one-twelfth of what it had been. Aside from improving the safety and comfort of the journey, the most important endeavor was constantly expediting it. Waghorn devoted most of his efforts to synchronizing the various sections of the route, preventing time gained by technological acceleration from being lost waiting for the next means of transportation, thereby wasting the fuel, and hence money, spent in acceleration. Synchronicity optimized the equation of time and money. Time was not only a quantity to be reduced but a standard to be adhered to, speed and synchronicity thus reinforcing each other. During the 1840s, travel time between India and England was already calculated by the minute, and complex calculi that factored the different speeds of vehicles, weather variations, and optimal stopping times at stations were devised to match synchronicity with speed. These calculi enabled unifying the multiple schedules of the different sections into a single standard timetable that came to embody the Overland Route. 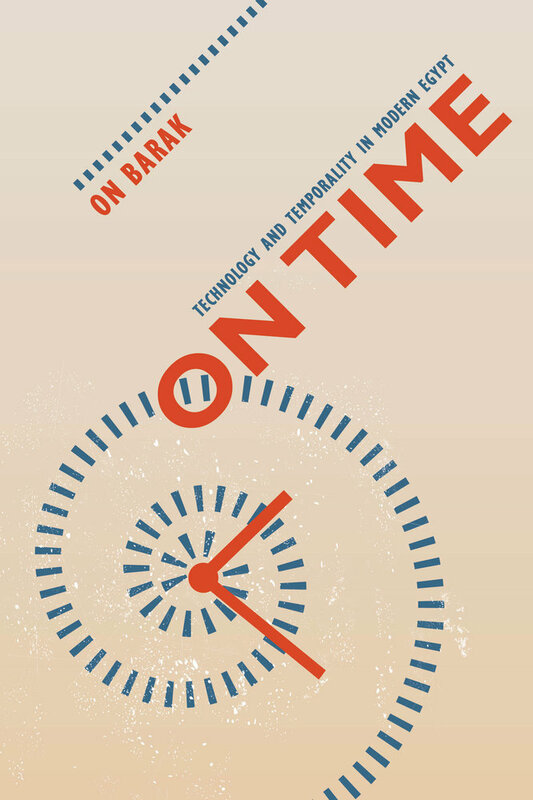 In this pioneering history of transportation and communication in the modern Middle East, On Barak argues that contrary to accepted wisdom technological modernity in Egypt did not drive a sense of time focused on standardization only. Surprisingly, the introduction of the steamer, railway, telegraph, tramway, and telephone in colonial Egypt actually triggered the development of unique timekeeping practices that resignified and subverted the typical modernist infatuation with expediency and promptness. These countertempos, predicated on uneasiness over “dehumanizing” European standards of efficiency, sprang from and contributed to non-linear modes of arranging time. Barak shows how these countertempos formed and developed with each new technological innovation during the nineteenth and early twentieth centuries, contributing to a particularly Egyptian sense of time that extends into the present day, exerting influence over contemporary political language in the Arab world. The universal notion of a modern mechanical standard time and the deviations supposedly characterizing non-Western settings “from time immemorial,” On Time provocatively argues, were in fact mutually constitutive and mutually reinforcing. On Barak is Senior Lecturer in Middle Eastern history at Tel Aviv University. He is the author of Names Without Faces: From Polemics to Flirtation in Islamic Chat-room Nick-naming (Uppsala University Press, 2006). “On Time’s primary contribution is to offer the first study of modernity in the Egyptian context that attends to the new technological modes by which that distinction in temporality was historically produced. This approach departs from the largely nation- and human-centered narratives of Egyptian history. By focusing on non-human agents and using a trans-regional perspective, a larger cast of actors and other vectors of historical change come into view. This work will advance both historical and critical efforts to de-center secular, pietistic accounts of our shared modern past, whether those pieties belong to civilizations, empires, nation-states, or humankind." “ [On Time] constitutes a fascinating contribution to a growing field of inquiry – namely, the social construction of time in colonial contexts. Through a close reading of a breathtaking variety of sources, ranging from newspapers to fatwas, from advice books to train schedules, On Barak develops a compelling narrative of how Egyptians, through the nineteenth and twentieth centuries, developed what he calls ‘counter-tempos’ – approaches to apprehending and navigating the ‘homogenous, empty’ time of Western modernity in profoundly subversive ways."